Cross of Glory is reading The Story: The Bible as One Continuing Story of God and His People. “The Story is an abridged, chronological Bible that reads like a novel. There are no verse references, and Scripture segments are seamlessly woven together with transition text into a single grand narrative. For those intimidated or overwhelmed by the unabridged Bible, The Story helps people understand God’s Word more fully and engage with it more easily. How’s it Going to Go? Each week, we will read one (sometimes two) chapters in the book. Pastor Dana will post a Reading Guide and (for some weeks) Study Resources to help you get the most from your reading. We will hear a sermon on that chapter on the following Sunday. The Story: Chapter 31 Guide- This week we cover our last chapter in The Story. (A big congratulations if you made it all the way through!!) Chapter 31 deals with the end times, described in the last book of the Bible, Revelation. As always, I've attached a study guide which provides a summary to this week's readings and some questions to consider as you read Chapter 31. The Story: Chapter 29 Guide- This week we cover Chapter 29 in The Story, which deals with Paul's missionary journeys. As always, I've attached a study guide which provides a summary to this week's readings and some questions to consider as you read Chapter 29. The Story: Chapter 28 Guide- This week we will cover Chapter 28 in The Story, which deals with the early church. This post contains a study guide which provides a summary to this week's readings and some questions to consider as you read Chapter 28. 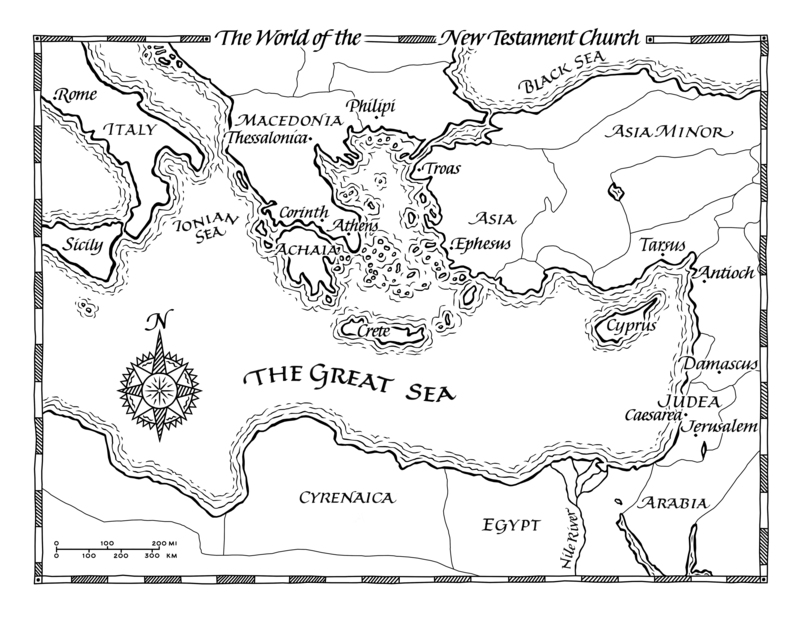 The World of the New Testament Church is a map which shows the geographic places mentioned in the next few chapters we'll be reading. The Story: Chapters 26-27 Guide- This Sunday we cover two chapters (but they are two chapters we're all pretty familiar with, so they should be a pretty quick read) -- Jesus' death and resurrection in Chapters 26 and 27 of The Story. The Story: Chapter 25 Guide- As we continue with Chapter 25 of The Story, we are nearing the end of Jesus' ministry. We'll look at claims that Jesus made about who he was, how he changed his followers understanding of what it meant to be the Messiah, and the question he asks all of those who want to follow him -- "Who do you say that I am?" The Story: Chapter 24 Guide- We are now well into the New Testament in The Story. This coming Sunday we'll look at Chapter 24, which contains some of Jesus' most famous teaching -- The Sermon on the Mount, the parables of the good samaritan and the prodigal son, and the Lord's Prayer. We'll also look at some miracles like the stilling of the storm, the raising of a young girl from the dead. And as you read, consider the ever widening rift between Jesus and the religious elite. Why are they so mad at Jesus? Why are they plotting to kill him? The Story: Chapters 22-23 Guide- After taking the summer off, we’re back into The Story for the next 8 weeks, looking at Jesus life, death and resurrection, and then focusing on the early church. We’ll first consider Jesus ministry and teachings and then see how this carpenter from Nazareth who was killed as an enemy of Rome, started a movement which changed the world and continues to this day. The Story: Chapter 21 Guide- This week is our last week in the Old Testament and we look at Chapter 21 in The Story which is all about the efforts to rebuild the people and the walls around Jerusalem after the exiles returned to Judah. If you’d like to go right to the source, you can read Ezra 7, Nehemiah 1-2, 4, and 6-8 and Malachi 1-4. The Story: Chapter 20 Guide- This week is our second last week in the Old Testament and we look at Chapter 20 in The Story, the story of Esther. Like Daniel, this story describes the intrigue and conflict involved as the Jews live in foreign courts. One of the fascinating things about this book in the Bible – it is the only one that never explicitly mentions God. And yet we see God all over this story. If you’d like to go right to the source, the entire story of Esther is found in the biblical book of Esther, chapters 1-9. The Story: Chapters 18 and 19 Guide- This week, we look at Chapters 18 and 19 in The Story, which cover both the exile as seen through Daniel’s eyes and the return to Judah seventy years later. Once again, these stories are also found in the Bible, but in lots of different places. If you don’t have The Story book, you can read Daniel 1-3, and 6; Jeremiah 29-31; Ezra 1-6; Haggai 1-2; and Zechariah 1 and 8. The Story: Chapter 17 Guide- This week, we look at Chapter 17 in The Story and see the end of the kingdom of Judah as the people there are exiled into Babylon. However, even then God provides hope for the people in the words of two prophets – Jeremiah and Ezekiel. Once again, these stories are also found in the Bible, but in lots of different places. If you don’t have The Story book, you can read 2 Kings 21, 23-25; 2 Chronicles 33, 36; Jeremiah 1-2, 4-5, 13 and 21; Lamentations 1-3, 5; and Ezekiel 1-2, 6-7 and 36-37. 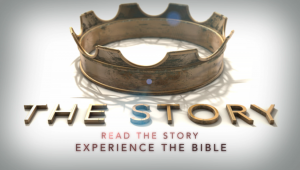 The Story: Chapter 16 Guide- This week, we look at Chapter 16 in The Story and finally see what it looks like to have a king who relies on God is times of potential disaster. While the Northern Kingdom literally disappears, Judah in the South renews its devotion to God (at least for awhile). Once again, because of all the different characters, these can be some difficult chapters to follow. If you don’t have The Story book, these stories are also found in the Bible (2 Kings 17-19, and Isaiah 3, 6, 13-14, 49 and 53). The Story: Chapters 14 and 15 Guide- This week, we look at Chapters 14 and 15 of The Story and discover how after Solomon’s death, things go downhill pretty quickly for God’s chosen people. Although Israel experienced unprecedented achievement and prosperity during most of Solomon’s reign, at the end his oppression of his people through taxes and conscripted work, and his worship of foreign gods, led to a divided kingdom after his death. If you don’t have The Story book, you can read 1 Kings 12-19, 2 Kings 2, 4, and 6; Hosea 4-5, 8-9 and 14; and Amos 1, 3-5 and 9. The Story: Chapter 13 Guide: Solomon- David’s son Solomon becomes king after David dies. Solomon is known for building the glorious temple in Jerusalem and for his wisdom, a gift from God. Just as many of the psalms are attributed to David, the biblical books of Proverbs, Ecclesiastes and Song of Solomon are attributed to Solomon. If you don’t have The Story book, you can read 1 Kings 1-8, 10-11; 2 Chronicles 5-7; and Proverbs 1-3, 6, 20-21. The Story: Chapter 12 Guide: The Trials of a King- This week we continue to look at Israel’s second king, King David. Many of us have heard of the story of David and Bathsheba, but this chapter also explores David's later years. If you don’t have The Story book, you can read 2 Samuel 11-12, 18-19; 1 Chronicles 22, 29; and Psalms 23, 32, 51. The Story: Chapter 11 Guide (David – From Shepherd to King)- This week we get back into The Story with a look at Israel’s second king, King David. We’ll start with the time after David was anointed king, but before he actually became king. If you don’t have The Story book, you can read First Samuel 16-18, 24 and 31; Second Samuel 6 and 22; First Chronicles 17; and Psalm 59. The Story: Week 9 Guide (Ch. 10)- This week we look at the first half of the First Samuel, as the Israelites are lead by their last judge and then their first king. The nation gets the king it wants, but as we all know, getting what you want doesn’t necessarily mean that things will go smoothly. If you don’t have The Story book, you can read Chapters 1-4, 8-13 and 15 of First Samuel. The Story: Week 8 Guide (Ch. 9)- This week we look at Chapter 8 of The Story - the biblical book of Ruth, a wonderful story of sacrificial love and redemption. The Story: Week 7 Guide (Ch. 8)- This week we look at Chapter 7 of The Story where the Israelites go through multiple cycles of choosing their own paths over God’s path, facing the consequences of their decisions, and finally repenting and turning back to God who steps in to save them. The Story: Week 6 Guide (Ch. 7)- This week we look at Chapter 7 of The Story. Here we continue the story of the Israelites long awaited entry into the Promised Land. The Story: Week 5 Guide (Ch. 5- Deliverance / Ch. 6 – Are We There Yet? )- This week we look at Chapters 5 and 6 of The Story. We finish Exodus as we look at Moses interactions with God and the receipt of the Ten Commandments. Week 4 Reading Guide (Chapter 4 – Deliverance)- This week we look at Chapter 4 of The Story, which moves into the second book of the Bible – Exodus. Here we continue the story of God’s redemptive plan through God’s chosen people. Week 3 Reading Guide (Chapter 3 – Joseph: From Slave to Deputy Pharaoh)- This week we look at Chapter 3 of The Story, which deals with God's ability to take what others intended for evil and turn it to something good. Week 2 Reading Guide (Chapter 2: God Builds a Nation)- This week we look at Chapter 2 of The Story, which deals with God building Abraham’s descendants into a great nation . Week 1 Reading Guide (Chapter 1: Genesis)- This week we look at Chapter 1 of The Story, which deals with God’s good creation, humanity’s choice to reject God and go our own way, and the implications of that choice. Journal Questions and Actions- Each week, you can use these Journal Questions for focus your study. Enter the Bible from Luther Seminary- Here you’ll find a wealth of resources to help you grow in your faith, add depth to your Bible studies and truly discover the people, places and events of the Bible. Think of Enter the Bible as your guide, a helpful reference tool to accompany you in your reading of the Bible. Introduction- On Sunday, January 14, 2018, Pastor Dana described the format of the book and how we will be reading the Old Testament portion this winter and spring. To get e-mail updates and information on Bible studies, be sure Dana has your e-mail address. Read Chapter 1 and join us on January 21, 2018 at 9:30 am.